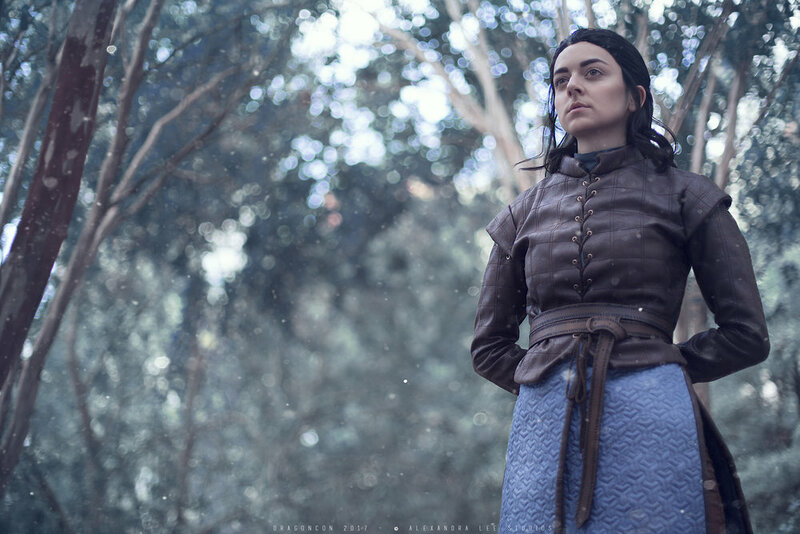 By far the questions I've been receiving the most about my Season 7 Arya Stark costume are about the quilting! Hopefully this will help you tackle this costume. Game of Thrones is known for their complex and unique textiles, from Daenerys’ “dragonscale” smocking to Cersei’s laser-cut leather, and Arya joins the club with this geometrically quilted blue fabric. Of course, the leather is quilted, too, making for a very quilting-heavy costume. Pictured: the reverse side of my doublet pieces, marked with a refillable chalk marker. Please disregard the cat hair! First, draw your guides on the wrong side of your fabric. The squares on Arya’s sleeves are slightly smaller than the squares on her doublet, so I did 1” quilting on the sleeves and 1.25” quilting on the doublet. On both the sleeves and doublet, the vertical lines are in pairs of two, and the horizontal lines are singular. Use pencil, chalk, sharpie, or whatever will mark on your fabric to draw your grid to guide your sewing. Now it’s time to stitch. You’ll want to use a matching dark brown thread for this. Also, test your stitch on scrap fabric first to make sure the seam shows up as strongly as you’d like. My regular stitch sort of disappeared into my fabric, so instead I used my machine’s triple stitch. It took longer to sew, but is much more visible on the garment. After piecing together the quilted pieces with the lining, you may want to go back and topstitch over some of your seams to anchor the leather to the lining. This will help stiffen the garment and prevent it from wrinkling or buckling in ways that Arya’s on-screen garment does not. If your leather is particularly thin or flexible, you might consider adding interfacing. You have three options for the blue fabric. First, you can try your best to track down a similarly patterned fabric. Depending on how accurate you want your fabric to be, you may or may not find something that satisfies you. Second, you can quilt it yourself on your sewing machine using the same method that is detailed above, in the “leather” section. It has been done, but I warn you that it is both incredibly difficult to do neatly and incredibly time-consuming. Finally, you can do what I did, and send your fabric to someone who owns a computerized quilting machine. The pattern itself appears to be — or at least be inspired by — a Japanese sashiko pattern known as bishamon armor, or bishamon kikkō. I was unable to find an existing computerized quilt pattern that I thought was close enough, so I designed my own in Photoshop based on close-up images of Arya’s costumes. I then sent that file to my quilter, who digitized it for her machine. She has made it available in her shop, so that you can purchase it and provide it to your own local quilter. To find a local quilter, I recommend asking around at your local fabric store or quilting store for recommendations. You will likely have to provide three things to your quilter: Your blue fabric, quilt batting (some quilters can provide this, at a cost of course), and a backing fabric. I used Hobbs 80/20 batting and black muslin for my backing fabric, since it would be covered up by my lining fabric anyway. If you want to simply use more of your blue fabric for the backing fabric, you could also choose not to line your garments at all. I thought a lining would look neater, which is why I chose it. Fair warning: This will be expensive. I sent my quilter about two yards of fabric, to cover both the split skirts and the doublet and sleeves, and it took an entire day to quilt. Each panel took two full hours — that’s time that the quilter needs to be present, keeping an eye on the machine. You should expect to pay a few hundred dollars for this service, unless you get very, very lucky. Let me know in the comments if you have any questions! Good luck!